Gradually whisk in the chilled sparkling water – do not over-whisk as this will cause gluten to develop in the flour which will form a heavy batter. Make sure that the ingredients you are coating are thoroughly dry to ensure that the tempura batter stays crisp. When making tempura vegetables, partially cook the vegetables before coating in batter as they won’t have time to cook through before the batter becomes crisp and golden. The tempura batter can be flavoured with spices. For example, Alfred Prasad adds chilli powder, ajwain seeds and cumin seeds to his batter mix for his Crispy plaice and mint pinwheels recipe. Tempura batter can be used to coat all kinds of foods. 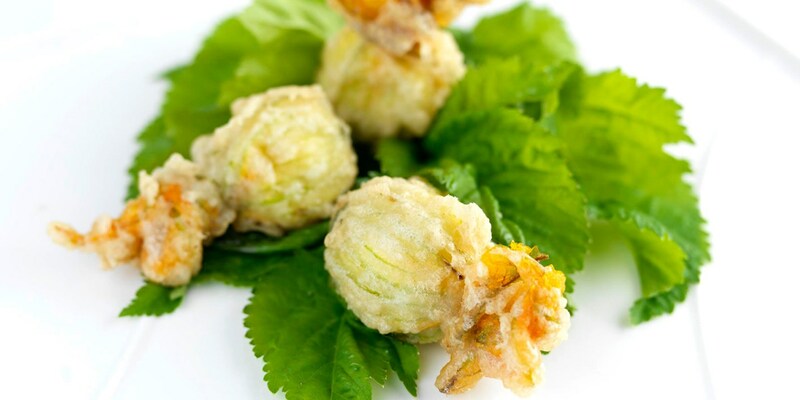 Frances Atkins creates a Tempura of stuffed courgette flowers in her recipe while Shaun Rankin uses crispy tempura prawns as an accompaniment to a smooth Sweetcorn soup. Chris Horridge serves his tempura-battered oysters with a sweet apricot purée, making a light but luxurious canapé.